The simplicity of a premise is sometimes the best possible concept for certain movies, and when the word comedy enters the mind, the finest examples we tend to think of first are those that don't reach so high to attain their sense of humor. This is essential thinking because laughter is most easily seen in everyday situations--at the office, in the school yard, on the streets, and even right in the home. The only real differentiating factor between each is the approach of the slapstick; some choose to provoke the comedy with cruelty and/or intentional distress, others simply rely on the threat of embarrassment to amuse the moviegoer. But there are limits, and one of the most frustrating aspects of "Snow Day" is its ability to take simplicity and twist it dry of every ounce of joy. The film is a dreary series of flat jokes and dimwitted characters that the director tries to pass off as something deserving of a theatrical run. There is a peculiar essence to the approach to begin with; rather than a simple presentation of the material, the story shifts directions and then splits into three dissimilar passages, suffocating the core subject with its numerous gaps. 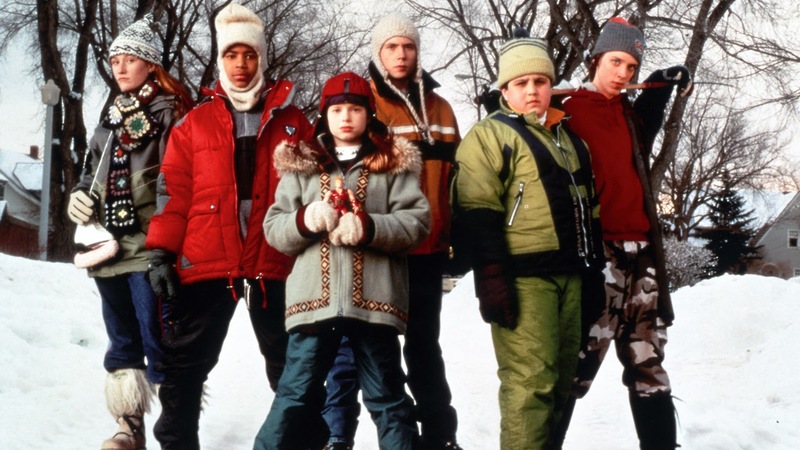 The thrill of any snow day is appealing to the general audience--but what audience does "Snow Day" reach for when using childhood fear, teenage romance and adult competition for its central devices, anyway? The movie opens promisingly enough, taking us to Syracuse, New York where children gather around radios at the approach of a monstrous but unforeseen snow storm. The only man who predicts this storm to hit, a weatherman named Tom Brandston in competition with others at nearby local television stations, begins as the central character in the entire development (played rather smoothly by Chevy Chase). Then we get to know the kids of the neighborhood (one of them named Natalie is actually Tom's daughter), who are thrilled at the prospect of everything being put on hold for a day. Everything after that begins to unravel. Ignoring the weatherman angle for the moment, the movie's main focus is on children, as to be expected. The fond memories of a snow day usually take place during child hood, the time when we leap at the opportunity of getting out of school for a day filled with excitement and joy in a blanket of white ice. Unfortunately, the children of Syracuse, New York want more than just one day off from school; their initial problem lies with the local snowplow, which is able to clear streets swiftly and is operated by a man played by Chris Elliot (also seen in "There's Something About Mary"). It is left up in the air as to whether the man behind the snowplow is crazy or simply turgid, but there is an intriguing rumor attached to his background--it is said by many that his car's chains are made from the braces of children he had run down with the plow. Even before there is any kind of thickening for the children's dilemma, though, yet another story is introduced. This time the focus turns to the teenage crowd, involving a kid named Hal (played by Mark Webber, also one of Tom's children) who is trying to get the most attractive female in the school (at least in his opinion) to notice him. Will he find romance? Will the snow day help? Obviously. But it's not like anyone cares. The whole plot structure is like a jigsaw puzzle without the edges; it builds slowly and but is never given a set of restrictions. This allows all hell to break loose with even further plot developments and character introductions, including Tom's wife who is a workaholic angered by the sudden snow arrival, and a snooty program honcho who forces the poor weatherman to dress up in the most ridiculous outfits ever made for a human being. Director Chris Koch, who steps behind the director's chair for the first time, looks to be in search of simple material to start his career with. But his problem is merely the jaw-droppingly strained screenplay written by Will McRobb and Chris Viscardi. To that effect, he is not one to blame for all of this insidious boredom, because his style and artistic ambition are at least competent while the story labors overblown buildups. Besides, the only thing worse than seeing complex ideas squandered away by inept filming is seeing even simpler ones dry up in the first ten minutes because of a dimwitted screenplay.